Jersey corn rocks. Right now, it’s everywhere…and it’s delicious. Which is why sometimes you may get a little carried away when you’re cooking it. So, the next time you find yourself up to your ears in corn, make this salad. Combine all vegetables in a large bowl. Toss with oil and vinegar, then season to taste. Serve at room temperature or refrigerate to serve cold. 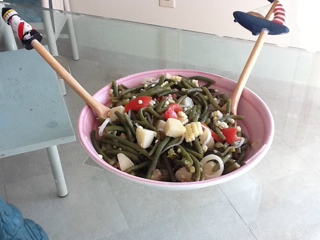 This entry was posted in beans, corn, potatoes, salad, side dishes, tomatoes. Bookmark the permalink. stop cooking till I get there! Oooh, corn season hasn’t quite gotten out here yet, but I’m so excited for when it does. I love all the fresh veggies in this salad. It looks perfect for summer! Love jersey corn. This salad looks so wonderful! Such cute serving spoons!